I often hear from my office window the whipping sounds of helicopter blades hovering over our medical campus as they prepare to land transporting a patient for emergency care. It's surreal to watch the medical team surround the patient on the Klempner Family Helipad, and I'm always comforted to know this patient has arrived safely in their arms. This spring, we celebrated the contributions of the physicians, nurses and staff, who work tirelessly every day to provide excellent care to our patients, with National Doctors Day on March 30 and National Nurses Day on May 6. Every year, the KentuckyOne Health Foundations provide funding for the annual outstanding DAISY Award. I encourage you to read more about this important recognition on page 12. We also encourage you to nominate a deserving nurse by visiting KentuckyOneHealth.org/DAISYAward or honor a caregiver by visiting KentuckyOneHealth.org/WaysToHelp. In addition to our caregivers, I also want to recognize a recent generous donation from the Atlas family to support pet therapy. 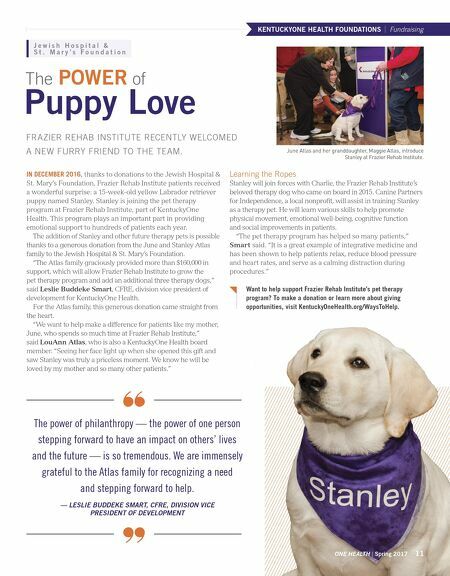 As a result of this generous donation, we have recently added a new puppy, Stanley, to our team at our Frazier Rehab Institute, part of KentuckyOne Health. Stanley will not only bring joy to our patients, but he will assist our medical teams in motivating patients to progress and heal more quickly. Enjoy reading about the puppy love that this gift has made possible. As always, we are grateful for donations that benefit the care of our patients. Thank you for your continued support of our mission. Leslie Buddeke Smart, CFRE Division Vice President of Development KentuckyOne Health J e w i s h H o s p i t a l & S t . M a r y ' s F o u n d a t i o n Leslie Buddeke Smart, CFRE 10 KentuckyOne Health | KentuckyOneHealth.org KENTUCKYONE HEALTH FOUNDATIONS Fundraising CARLEIGH AND THE sixth grade students at St. Patrick's Catholic School host an annual fundraiser called Carleigh's Kicks for Kids. Shoes are donated to children at Our Lady of Peace, part of KentuckyOne Health, in Louisville. In January, more than 380 pairs of shoes were donated. 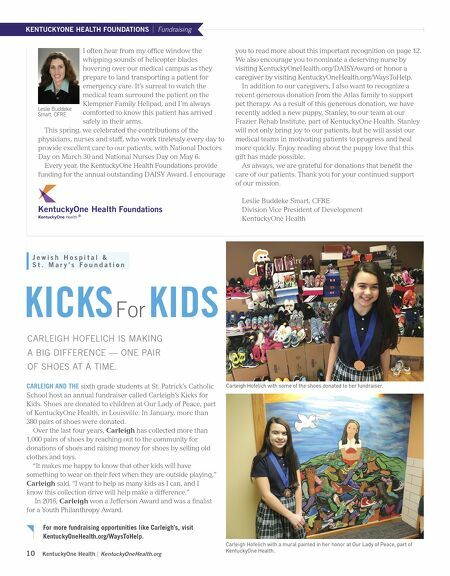 Over the last four years, Carleigh has collected more than 1,000 pairs of shoes by reaching out to the community for donations of shoes and raising money for shoes by selling old clothes and toys. "It makes me happy to know that other kids will have something to wear on their feet when they are outside playing," Carleigh said. "I want to help as many kids as I can, and I know this collection drive will help make a difference." In 2016, Carleigh won a Jefferson Award and was a finalist for a Youth Philanthropy Award. For more fundraising opportunities like Carleigh's, visit KentuckyOneHealth.org/WaysToHelp. CARLEIGH HOFELICH IS MAKING A BIG DIFFERENCE — ONE PAIR OF SHOES AT A TIME. For KIDS KICKS Carleigh Hofelich with a mural painted in her honor at Our Lady of Peace, part of KentuckyOne Health. Carleigh Hofelich with some of the shoes donated to her fundraiser.